Each XML element details the content of a single XML document type (ex. : a thesaurus or bank of employee resumes). It lists the fields from which CES extracts information. Note that all document types found in a repository must have a corresponding element (otherwise, they are not indexed). In the XML Document Definitions page, click the appropriate XML document definition. 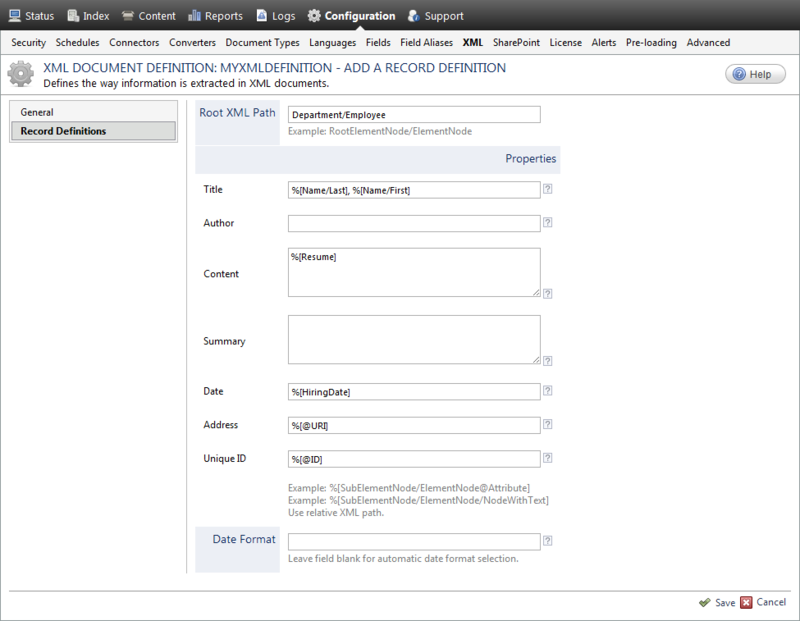 In the Record Definitions page, click Add. In the Root XML Path box, enter the path of the XML node corresponding to the document (in the form RootElementNode/ElementNode). Each root XML path must be unique within an XML document definition. Under Properties, enter XML relative paths in the form %[xmlNodePath@attributeName] to build the value for each property. For a description of the property fields, refer to the table below. Title Identifies the title of the document. Example: If %[@Title] is entered, CES searches for an XML node attribute entitled Title from which to extract the information. Author Identifies the author of the document. Example: If %[@Author] is entered, CES searches for an XML node attribute entitled Author from which to extract the information. Content Identifies the content of the document. Example: If %[@Description] is entered, CES searches for an XML node attribute entitled Description from which to extract the information. Summary Identifies the summary of the document. Example: If %[@Summary] is entered, CES searches for an XML node attribute entitled Summary from which to extract the information. If this field is left empty a summary is automatically extracted by CES. Date Identifies the date of the document (creation or modification date). Example: If %[@CreationDate] is entered, CES searches for an XML node attribute entitled CreationDate from which to extract the information. If those fields are left empty, the parent XML document date is issued. Address Identifies the link to open when a search result is clicked. Example: If %[@URI] is entered, CES searches for an XML node attribute entitled URI from which to extract the information. When a user clicks the search result, the value of the metadata is used to open the document. If this field is left empty, the parent XML document is opened when the search result is clicked. Unique ID Only identifies the record within the XML document. This information is used to construct the URL of the document and is useful to locate a particular record on big XML documents. If this field is left empty, a sequential number is used as the unique ID. Example: If %[@ID] is entered, CES searches for an XML node attribute entitled ID from which to extract the information. In the Date Format box, enter the format of the dates contained in the XML document (see Specifying a Date Format). Example: The following XML document regroups employee resumes. Its root element is Department and its record node is Employee; therefore, its root XML path is Department/Employee. Rebuild the source (see Applying an Action to a Collection or a Source).